Fluorescent tubing lights up the club of a youngster playing during the Pro Kids 24-hour Golf-a-Thon at Colina Park Golf Course. Playing partners are appropriately still with a member of their group addressing the ball on the tee. Pro Kids has not only reached its goals, it has exceeded them. By leaps and bounds. Thousands of kids have had their lives positively impacted by the organization. Some kids have gone on to play golf in high school and college, but it has made an even greater impact on them in the classroom and other aspects of life. 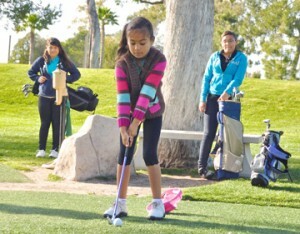 Pro Kids’ initial success led it to becoming one of the models for The First Tee (Pro Kids became The First Tee of San Diego), an international organization with a similar mission. The par-3 Colina course and facility has been transformed into a showplace since Pro Kids took over. The condition of the course now rivals some of the county’s full-size courses and it is treated with pride and respect by its young players. In 2001, a 7,000-square foot Learning Center was constructed with the assistance of the Building Industry Association, providing an environment conducive to studying and learning. I enjoy checking in with Pro Kids every so often to see what’s going on. This past weekend was its second annual 24-hour Golf-a-Thon. Seventy-five people — most of them kids — participated in the fundraiser, earning money from sponsors for each hole they played. The event is expected to raise close to $35,000 toward the construction of a new Pro Kids/First Tee facility in Oceanside. Groundbreaking for the project is to begin next month. Having a pull cart is essential on the course when your golf bag is nearly as big as you are. The most exciting part of the event was when darkness fell. The fairways and greens were lined with green glow sticks (hazards were outlined with red glow sticks) and the players were equipped with blue, red, green and yellow glow balls. It was impressive to see the enthusiasm and energy displayed by the kids, who were all determined to play from dusk to dawn. “It’s exciting for them to be able to play at night, to be able to sleep here,” said Dana Nitti, director of development for Pro Kids, who had some sleeping bags on hand in case anyone was overcome by exhaustion. Supporters Kim and Paula Eggleston of Rancho Santa Fe pledged $1,000 for each hole-in-one during the event. There were nine aces — including two by La Jolla High freshman Sean Payne — among the 587 rounds (10,566 holes) played on the 1,567-yard course. Payne played 43 rounds (774) over the 24 hours, breaking his record of 41 rounds played last year. Like the other kids, he was most excited about playing at night. With Pro Kids, the sky’s the limit. This entry was posted in Golf & Sports, San Diego Events and tagged Colina Park Golf Course, First Tee of San Diego, glow ball, golf, Golf-a-Thon, Pro Kids Golf Academy by Kirk. Bookmark the permalink. 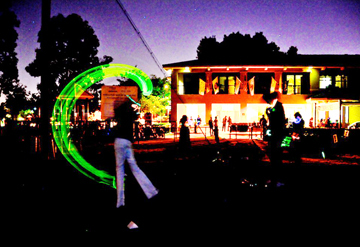 Fun to watch that fluorescent tubing that glows in the dark.My kids would love that. 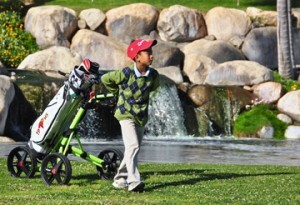 Aside from the fun activity golf offers it also provide well rounded health benefits for the kids.